In a wānanga last week I was reminded in a presentation that included a generic Māori cosmology, that many struggle to make sense of the incestuous relationship between Tāne Mahuta and his daughter Hinetitama. The average person tends to skip over it, mumble a few lines about it being mythological, or just the way it was. Now a caveat. There are experts, tohunga in this area who would not skip over anything. They hold an indepth knowledge of Māori cosmology that includes lengthy whakapapa for all atua, that provides exact explanations of the relationships between them, and their knowledge is contextualised from hapu to hapu, iwi to iwi. Those people are few and far between now, and I am not talking about them. I am talking about our kaimahi in health, community and social services, our kaimahi who keep marae running, our kaiako at schools, kura and kōhanga reo; all of our people who every now and then have to get up in front of someone and connect the ira atua to the ira tangata. Our knowledge is a mongrel of doubtful parentage – half-remembered stories from kaumātua; rushed assignments at wānanga and university; our own fits of interest that led us to read a bit of some books. That’s the us I am talking about. We’re the ones who dread the question but are often asked it by bright eyed young Māori searching for insight into their Māoritanga and asked it by converted Pākehā looking for inclusion and reassurance about the bicultural journey. Often there’s a little less detail in the ira wahine/ira tane from Io to Rangi and Papa, but you get the idea. The story after this goes that Tāne, in wānanga with his brothers, sought the continuation of their whakapapa by the creation of ira tangata. They were aware that this would only be possible in combination with uha, the female element. Tāne reached the conclusion that this would have to be created from their mother Papatūānuku at Kurawaka. There he formed the body and all it’s parts from the soil. He then pressed his nose to the nose of the soil sculpture and shared his breath. She sneezed and was brought to life, to be named Hineahuone (or Hinehauone). Tāne and Hineahuone had a daughter, Hinetitama. Again with the aim of continuing whakapapa and because of his great attraction to her, Tāne lay with his daughter, and they also had children. Later, Hineahuone asked Tāne who her father was. He answered that she should go and ask the posts of the house. When she regarded the posts, they were uncarved, an indication that their line was the only whakapapa line, and therefore that her father was also her lover. In her great shame, Hinetitama turned her back on Te Ao Mārama, the great gift of Tāne’s feat in separating his parents, and returned to Te Pō. Her final words to Tāne were an expectation that he would protect her mokopuna in their time in Te Ao Mārama, and at their death she would be their guardian. So she became known as Hinenuitepō. This is one of the great tragedies in our mythos. This is apparent in the horror of Hinetitama at the wrongness of their connection, and the sorrow of a bereft Tāne as she leaves him behind. Yet it is more than just a tragedy, it is a demonstration of the values and philosophy that make up the Māori world view. It is a theodicy. A theodicy is an attempt to explain why there is evil, why there is pain and suffering, in our world. Whether by study or cultural assimilation, you will be aware of the basic Christian theodicy: evil entered the world when Adam and Eve eschewed relationship with God in favour or their own autonomy, represented by the act of eating a forbidden fruit. What was good, that is the world and all that is in it, entered a fallen state. Substitution theology (I’m not a big fan personally) would have us believe that Jesus’ death on a cross was the freely chosen but necessary cost to redeem us from the consequences of Adam’s act. To put that more simply, the Church has always believed that humanity has fallen from grace. The Māori theodicy is outlined in the tragedy of Tāne and Hinetitama. Firstly, note that there is no judgement from a third party, nor between the parties; Tāne is not condemned by anyone or thing as evil for having committed this act and Hinetitama is not considered evil for her involvement. There is tragedy; there are no statements of blame or judgement – it is what it is. We can confidently say on the basis of the way in which this myth is communicated that Māori do not believe pain and suffering entered the world because humanity has a fallen nature. However, pain and suffering did enter the world at this point. Their own grief, and the establishment of death as the inheritance of all of Tāne’s descendents is the beginning of pain and suffering for humanity. So if it was not because Tāne and Hinetitama were judged evil by their nature, then what is the lesson? I assert that pain and suffering enter the world at this point through corrupted relationship. Tāne and Hinetitama’s relationship is revealed as corrupt and they both suffer consequences as a result. These consequences are not righteous judgements because the are shared equally. 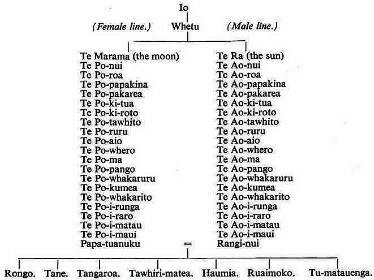 These consequences are a natural result of the diminishment of the tapu of Hinetitama and Tāne by the act of corrupting their father-daughter relationship. The Māori theodicy is that pain and suffering exist in the world when relationships are corrupt or dysfunctional. I think this is the most amazing wisdom buried in one of our most well known myths. People need not fear their own individual evil on the inside, need not fear a judgemental god, need not distrust the evil in others. In this Māori theodicy, people need only look to the quality of their relationships to understand the pain and suffering in their lives. It demonstrates both a very communal perception of our lives (they are lived in relation to each other) and an acceptance that we all have the potential to right and wrong, yet we are not labelled and condemned by the wrongs we commit. The confusion and uncertainty with which we address this myth of incestuous contact suddenly becomes a keystone to a moral framework that relies on functional, healthy and quality relationships. I like to think that, as she left Te Ao Mārama, this is Hinetitama’s parting gift to all of her descendents. Thanks for this post. It addresses views that have been ihoughts for a long time, and gives me valuable alternatives to think about. Thanks Ian. I removed your contact details from the comment, just to keep you safe from trolls! Fantastic post, thanks Graham. I think we have tended to undervalue Māori mythology for what the myths tell us about the world now…and you have identified a really important aspect that we should all take note of. Another important mythos is that of the conflict between brothers that marks so much Māori mythology, see the Maui myths, the separation of Rangi and Papa, and there are others beside, such as the Tawhakai cycle. This conflict always gives rise to new creativity and new spaces for human potential to thrive. I think of this often when we moan about conflict between hapū or iwi; as painful as these things may be, such conflict is also essential for growth. Thanks for the post!! As always you provide interesting and insightful commentary yourself! I am working on cosmology in my Masters, so thanks for sparking off more ideas. It sounds like a must read 🙂 I think it’d be really helpful to read it. …to be honest, I have always wondered how Hinetitama interpreted the cryptic answer provided by Tane. Very good! Kia ora Mark, this is, of course, just one possible interpretation. I’d welcome hearing others. Recently due to first hand experience I have been thinking more than usual about harm caused by Maori to Maori within families or small communities and how this can be addressed in 2014 environment: acknowledging whakaaro Maori as well as “the law” and considering impacts and accountabilities. It is about relationships, but some of those relationships are destructive and harmful: child abuse, domestic violence, neglect. It can be difficult to see an end to downward spirals when there is no intervention – culturally congruent or otherwise. At the same time, available interventions do not always lead people to a better space. Your blog has given me more to think about. – ngā mihi nui mō tēnā. Kei te mihi hoki ki a koe, Merenia. It is difficult to see an end to the dysfunction we see around us and perhaps in our own whānau. I think re-educating each other about how to actually do a relationship is a must now; very few of the people I have supported know how to relate to other people very well. Our marae communities also need to become less insular. Insularity has led to many neuroses. An outward facing community is more healthy and less focused on itself and its own perceived problems.